It was more than two years ago, Sunday, May 5, 1996, when an East Galesburg man searching for mushrooms with two teenage boys stumbled upon the skeletal remains of a human body. They were wandering through the grounds of the former Purington Brick Yards in East Galesburg. When Richard Poulson called dispatchers at the Public Safety Building to report his discovery, he initiated one of the most unusual, curious, complex and ultimately satisfying investigations in the history of the Knox County Sheriff's Department. Last Friday Sheriff Ken Harding announced that the "Jane Doe" discovered that day had at last been identified to a high degree of probability. Despite well-publicized problems in the Sheriff's office, that press conference underscored the often-overlooked fact that even when confronted with seemingly insurmountable obstacles this department is capable of impressive police work. Following a two-year investigative odyssey, Lula Cora Phillips, known to most as Cora, has been identified as the probable person whose remains were found in that long-abandoned brick kiln. Cora was born October 30, 1926 in Galesburg and lived most of her life in East Galesburg near the brickyard. Family members told the Sheriff's Department that they last saw a 44-year-old Cora around August 1970. Although no one in the family recalled seeing or hearing from Cora during the past 28 years, no missing persons report was ever filed. According to officials in the Sheriff's office, Cora was described as mentally disturbed and having "the mental facilities of a ten-year old." Apparently, Cora regularly disappeared for long times­­ returning later to visit family or friends. Perhaps this history accounts for her family's never reporting her missing. The date of her death is impossible to determine exactly from the remains recovered but Sheriff's Investigator Jim Thompson believes that Cora probably died of exposure during the winter months of 1970-71. During the investigation Thompson and other Sheriff's deputies were told of area children reporting a mysterious lady living in an abandoned trailer at the brickyard. The trailer is believed to have burned in the late fall of 1970 which would have forced Cora to seek other shelter. The remains discovered in one of the hundreds of deteriorating old kilns were contained in a plastic garbage bag. This initially led investigators to assume that foul play may be involved in the victim's death. The Illinois ­ Wisconsin Search & Rescue Dogs, based with the McHenry County Sheriff's Department in Woodstock, was quickly contacted to search the large brickyard for other bodies. This nonprofit organization of specially trained volunteers freely offers to serve law enforcement agencies in searches for missing persons, evidence, weapons and cadavers. The search of the brickyard turned up no other bodies and, surprisingly, little evidence of Cora or anyone else residing there for any length of time. "We didn't find any evidence of foodstuffs, clothing or cooking utensils one might expect if someone were living in the kiln for any length of time," said Thompson. "This leads me to suspect that most of Cora's belongings and supplies most likely were lost in the trailer fire and she sought temporary refuge in the kiln. Unfortunately the weather in late fall or winter in this area would make it very likely that someone without proper shelter or clothing would succumb to exposure in short order." Upon further study, investigators discovered that the plastic garbage bag was actually being worn by Cora as rain gear or a windbreaker over her other clothing. Holes had be cut or torn for her head and arms. So what at initial glance appeared to be a discarded victim of foul play became an indigent vagrant whose death was apparently at the hands of Mother Nature. At this point, even though foul play was ruled unlikely, the Sheriff's Department still had the task of identifying badly decomposed skeletal remains that had been partially exposed to the elements for over a quarter decade. The first step in the investigation was to determine as much information about the victim as possible from the remains recovered. 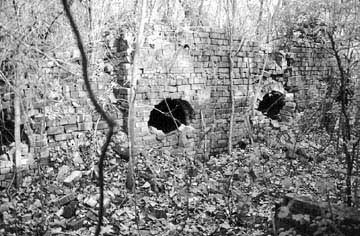 With the assistance of the Illinois State Police Crime Scene Investigators Thomas Merchie and Michael Ogryzek, Knox County Coroner John Watson and the Sheriff's investigators painstakingly collected all of the bones and other evidence from the kiln. State Police Anthropologist and Master Sergeant Mark Johnsey then laid out this material in anatomical order on a large examination table at OSF St. Mary Medical Center to be photographed and studied. From his analysis, Johnsey was able to determine that the remains were from a short (approximately 4'7" in height), heavy-set white female between 59 and 71- years-old. Samples of light reddish brown hair were also discovered with the body and no signs of obvious trauma or foul play were observed. The entire skeleton was found lying on its side in a fetal position on top of a plastic trash bag, perhaps serving as a ground cloth. 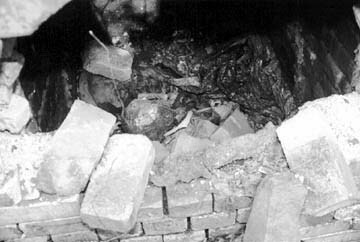 Five other still-folded trash bags were adjacent to the body but nothing else was found in the kiln. The victim wore a blue front zipped sweatshirt over a black and red striped blouse and light- colored polyester slacks. She also wore a pair of tan "Kanga Roos" boots, size eight. 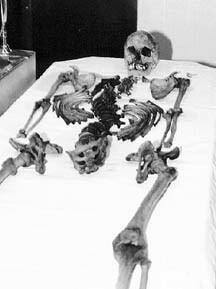 Based on the condition of the bones and clothing, Johnsey determined that the victim had died at least ten years prior to her discovery, probably longer. The approximation of the height, weight and gender from skeletal remains is fairly common practice. Determining the victim's race is only slightly more complicated despite the total absence of pigmented skin. Measurements of the skull and facial features allowed Johnsey to determine conclusively that the victim was white. There was also evidence of "advanced osteophytosis" in the victim's vertebrae and joints. Many of the skeletal teeth had fallen off the jawbones and Thompson had to literally climb into the kiln and methodically dig around to recover many of the body's teeth. "That was not a fun or comfortable task," he remarked. From this point, the next step was for Thompson to begin compiling a list of potential victims: "We began with well over 100 possibilities based on regional missing person reports and reported 'walkaways' from the former Galesburg Mental Health Center. We then began to systematically eliminate candidates based on the available information. This was a tedious and frustrating process but far less so that it might have been only a few years ago. With the availability of computer databases and the Internet much of the drudgery was reduced. We contacted police agencies throughout the area seeking potential candidates." The skeleton had been sitting in the kiln for more than a decade and many of those older records were never computerized and some had been lost or destroyed. Another problem encountered was that the Social Security Administration refused­­ on the basis of privacy concerns­­ to release information from their files. Investigators had hoped to use Social Security records to rule out potential victims by discovering evidence of either contributions or payments made since the estimated time of death. The first forensic reconstructionist contacted by the Sheriff's Department declined to attempt a reconstruction of the victim's face because of the condition of the remains and the absence of teeth. Another avenue attempted was to conduct a DNA analysis of the remains. The Sheriff's Department contacted Cellmark Labs of Germantown, Md. to arrange for a DNA profile of the victim. That analysis proved inconclusive due to weathering of the remains-- particularly the bone and marrow cells. Through their investigation the Sheriff's Department was eventually able to rule out nearly all of the possible victims but that wasn't good enough for Thompson. "I was growing afraid that this case would never be solved and I am really bothered by unsolved cases. Some have suggested that since there was no evidence of a crime that we shouldn't continue to pursue the matter but Sheriff Harding and I felt strongly that it was our duty to the surviving family members to do our best to identify our Jane Doe." Thompson was running down leads and scratching off possibilities in what little free time he had while handling the rest of his normal caseload. At one point it was decided to seek out another facial reconstruction expert to once again help identify the victim. The Midstates Organized Crime Information Center in Springfield, Mo. was contacted. 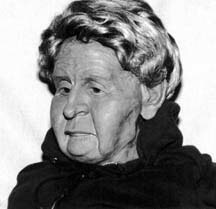 An employee of theirs, Viki Hansen, was trained as both an artist and a facial reconstructionist but had never yet had the opportunity to complete an actual reconstruction. She agreed to volunteer her time on this case; the skull was sent to her along with the anthropological and crime scene information but no material specific to any of the potential remaining identities. By the time Hansen completed her work, the list of likely persons was down to just two­­ including Cora. Hansen took a variety of photographs of the reconstructed head and sent them to the Sheriff's office where Thompson arranged for family members to view the results. Almost immediately it was obvious that where one victim deviated markedly from the reconstruction images-- Cora was astoundingly and uncannily similar. Cora had first come up as the potential individual shortly after the remains were discovered when Joanne Allen of Abingdon came to the Sheriff's office to inquire about her long-lost mother. Allen was one of at least 14 children Cora bore during her lifetime and was adopted and raised by her aunt, Cora's sister. "We had been wondering about my mother's whereabouts for a couple of years. Since we lived directly across the street from the brickyard years ago I thought there was a possibility that the body discovered might be my mom," explained Allen. "Her mind was never very sharp and she had suffered a variety of emotional problems. Mentally she remained a child throughout her life. The last time I saw her was at my adopted mother's home in August 1970. She had also been at my wedding that previous June." Asked why no missing persons report was ever filed, Allen paused briefly before trying to describe the behavior of her mother. "She constantly traveled all over. She'd be around here for a while and then suddenly disappear for months on end. We know she traveled throughout southern Illinois, Kentucky, Georgia and Florida. During her travels she'd meet men and become pregnant but I have a great deal of respect for her because she saw to it that all 14 of her kids were placed in good homes and raised well." "When Jim Thompson called my aunt and me in to look at the photographs I was immediately struck by the resemblance between the reconstruction and my grandmother. It was amazing and you could also see a tremendous resemblance between the reconstruction and my cousin. I am absolutely convinced that the body found is that of my mother and that gives me a big sense of relief. I am very satisfied to know that she's not hurting anymore." Thompson has seen this investigation all the way through and never gave up despite the many frustrations. "The key to this success has been the implementation of modern investigative techniques within the Sheriff's Department. This was also a great success for Viki Hansen. She was ecstatic at the results of her very first real reconstruction. And this provides important closure for Cora's family. There were a number of firsts in this investigation for our department and the neat thing is that aside from the man hours devoted to it, the cost was small. I'd estimate we received well over $100,000 worth of special investigative services for only about $1,500 in Sheriff's funds."